The American Academy of Otolaryngology—Head and Neck Surgery and its Foundation are pleased to announce that its clinical data registry, RegentSM, has been approved as a Qualified Clinical Data Registry (QCDR) by the Centers for Medicare & Medicaid Services (CMS). RegentSM is the otolaryngology-specific clinical data registry that allows Members to report on quality measures for federal and private programs. With RegentSM, AAO-HNSF is investing in our Members’ future, a future that will increasingly involve payment based on quality of care and performance measurement. The registry will become the foundation for quality improvement and research, will define quality for the specialty, and will support certification and licensure. The RegentSM pilot is underway and AAO-HNSF staff members are working closely with FIGmd, our vendor, to onboard the remaining sites committed to Regent’s successful pilot. 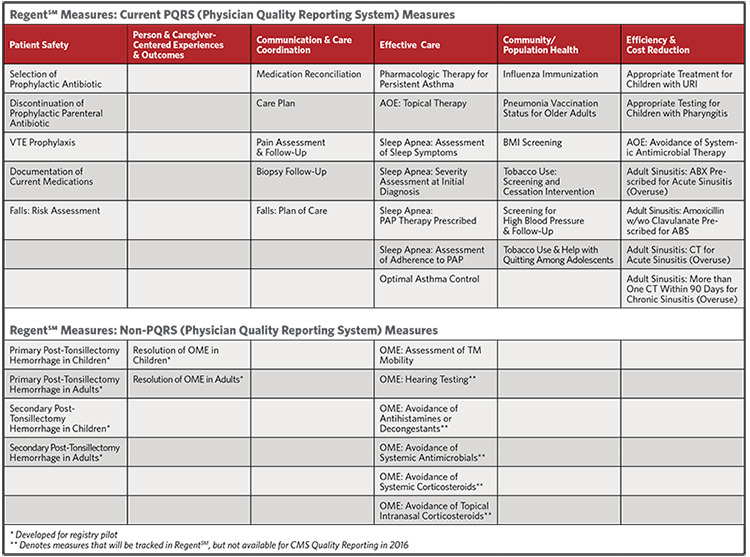 Regent’s list of proposed measures for quality reporting is just the beginning. The RegentSM Executive Committee is in place and seven Clinical Advisory Committees are being developed to create measures covering the depth and breadth of the specialties of otolaryngology-head and neck surgery. Each specialty will have measures contained in RegentSM. The registry is being constructed in a modular format with measures development and quality improvement as the focus in alignment with public and private quality reporting. Over time and as data is gathered, RegentSM will support research, clinical effectiveness, and device surveillance. “We are proud to be part of the RegentSM pilot and are looking forward to its successful launch. 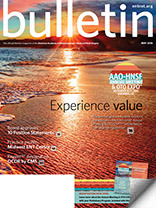 This effort affords otolaryngologists in all practice environments the ability to meet the changing demands of capturing and reporting quality data. Additionally, RegentSM will offer a specialty-centric platform for achieving this and much more in one secure, user-friendly location. Data is critical to the delivery of high-quality patient-centered care and Regent is the future,” said H. Louise Eddy, MS, CCC/A, FAAA, executive director of Texas Ear, Nose & Throat Specialists, P.A., in Houston, TX. The RegentSM pilot sites represent the vast expanse of otolaryngology practice settings, including hospital-based practices, academic medical center practices, and private practitioners. The pilot phase is a critical step in the development of RegentSM and will enable the AAO-HNSF to test its performance measures and ensure accuracy and reliability of extracted data. Once the pilot phase is complete and the registry is fully tested, it will be launched to the full membership in the summer of 2016. Data will be continually evaluated, CMS reporting will commence in early fall, and a portfolio of new measures addressing all of the specialties of otolaryngology will be developed. Patient care is improved as Members engage with their own performance data in Regent℠ and track to national benchmarks. Allows Members participating in Regent℠ more seamless CMS quality reporting in 2016 and will address new reporting requirements under the Merit-Based Incentive Payment System (MIPS). Members will find more meaningful measures as the Qualified Clinical Data Registry designation affords the AAO-HNSF the opportunity to create up to 30 otolaryngology-head and neck surgery-related quality measures for quality reporting and quality improvement. It’s physician-friendly. With little data entry burden to physicians and staff, patient data will be extracted, transformed, and loaded into Regent℠ from the practice’s electronic health record system, practice management system, or administrative data system. Members’ reporting burden is eased as Regent℠ qualifies as a specialized registry for Meaningful Use (MU) Modified Stage 2 and 3 for Eligible Professionals. It affirms the AAO-HNSF Regent℠ governance and oversight, performance measures, data security and privacy procedures, and data auditing procedures meet CMS requirements. Texas Ear, Nose & Throat Specialists, P.A. Watch for updates as more sites are on the way.